It's time for another episode of 205 Live on the WWE Network! It's a new era in 205 Live, and one that could change the course of this show. The Cruiserweight Championship is vacant, the tyranny of a train conductor is over, and a General Manager will be named TONIGHT! Who could it be? What will the new GM do about the Cruiserweight Title? Tune in for all the details after Mixed Match Challenge ends on Facebook Watch. Hit F5 at any time to refresh the live recap! 10:23 PM ET: SmackDown Live General Manager Daniel Bryan comes out to the stage, and he's WITH ROCKSTAR SPUD! The crowd has mixture of "Spud" and "Rockstar Spud" chants. Bryan talks about being involved with the Cruiserweight Classic and how it was near-and-dear to his heart, and says the new GM will usher in a new era in 205 Live. Bryan: "Under his leadership, he is going to give us the kind of action that the cruiserweights should've always given us, the kind of action that you guys want, the kind of action that I want, the kind of action that everybody wants! So please, allow me to introduce you to the new General Manager of 205 Live, Drake Maverick!" The crowd boos this name. Vic Joseph even notes on commentary that he was previously known as Rockstar Spud. Drake Maverick: "Ladies and gentlemen, my name is Drake Maverick, and I have worked my entire life and dedicated my entire career to stand here in front of you in the WWE. And I'm proud to stand here in the WWE. Thank you Daniel Bryan because I am even more proud to stand here in front of all of you as the 205 Live General Manager. I'm gonna help 205 Live, and the first thing I'm gonna do is we need ourselves a Cruiserweight Champion, don't we?! So here's what we're gonna do, a 16-man single elimination tournament. The winner becomes the new Cruiserweight Champion, and it's gonna culminate at the grandest stage of them all, WrestleMania. Oh but don't worry, we're not gonna see the whole tournament at WrestleMania. We're gonna start that tournament right here tonight! We're gonna have here tonight two first-round matches in the WWE Cruiserweight Championship Tournament! Hit the graphics!" Gran Metalik takes on Cedric Alexander in one match, and in the other one TJP will face Tyler Bate! (WWE sure loves their tournaments to crown new champions!) "My lords, ladies and gentlemen, my name is Drake Maverick. Let the WWE Cruiserweight Championship Tournament begin!" Cedric Alexander comes out first and shakes Maverick's hand on his way to the ring. In pre-match comments, Alexander basically says that even though he has to start from the beginning, he's confident he will win the tournament and the championship. Kalisto and Lince Dorado give Gran Metalik some encouragement, and Rockst... err, Drake Maverick shakes his hand and wishes him luck. Nigel McGuinness talks about the new GM and figures he will do well here. The vacant championship is propped on a pedestal at ringside as motivation. The bell dings, they shake hands, locks up, Metalik with a rear waistlock, Alexander takes an arm, Metalik reverses, Alexander counters into a side headlock, Metalik pushes him off, Alexander leapfrogs, backflips into a headscissors, but Metalik rolls through. Alexander ducks under a backflip, Metalik goes for a jumping hurricanran, and this time Cedric lands on his feet. Cedric goes for a rear waistlock, Metalik takes him down with an armbar, Cedric tries to counter but Metalik takes him back down by holding on. Alexander breaks free, back kick, chop to the chest, Irish whip into a corner, Metalik floats onto the apron, kicks him in the head and connects with a high springboard dropkick. Alexander comes back with a springboard clothesline, kips up, hits the somersault plancha, rolls through, throws him back in the ring and gets a 2-count. Alexander puts him in a straitjacket chinlock, Metalik gets to his feet, Alexander pulls him back down, covers for 2, chop, Irish whip, blocks a hurricanrana, goes for a powerbomb, and Metalik counters with a sunset flip bomb for 2.5! Alexander hits the Neuralizer (handspring enziguiri), covers, gets a near-fall, Metalik is back up in a corner, Alexander charger, Metalik superkicks him, does a reverse sling blade, walks the ropes, lands a missile dropkick, Alexander rolls out the ring, and Metalik bounces off the ropes for a somersault plancha! The crowd gives a respectable "205" chant. Metalik throws him back in the ring, lands a springboard splash and gets a near-fall. Alexander blocks the Metalik Driver, hits a European uppercut, Metalik superkicks him, Alexander catches him with the STANDING SPANISH FLY and gets 2.5! Both men are down, Alexander uses the ropes in a corner to stand, Metalik slaps him on the chest in a corner, Alexander slumps down, Metalik picks him up onto the top turnbuckle, slaps him on the chest again, Alexander fights him off, but Metalik rocks him with a kick to the head, climbs up top, does a jumping hurricanrana off the ropes and covers for 2.9! Metalik with forearms, Alexander hits a hard back elbow, catches him in mid-air after a handspring, Metalik counters the Lumbar Check with a spike DDT, covers and gets 1-2-KICKOUT! Metalik drags him towards a corner, climbs up top, goes for a moonsault, Alexander sticks his boots up to block, picks up him, delivers the LUMBAR CHECK and gets the 3-count! 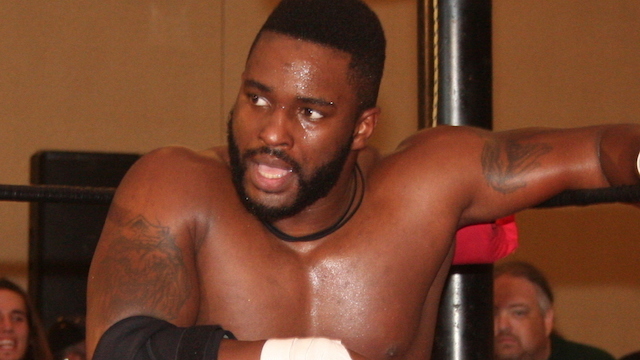 WINNER and Advancing in the Championship Tournament: CEDRIC ALEXANDER. Metalik rolls to the floor to recover. Alexander just missed him as he went to check on him, but still shows his respect to him and continues to celebrate his victory. We get a video package for the first-ever WWE United Kingdom Champion, Tyler Bate! Backstage, Gentleman Jack Galagher is happy that the new GM is a fellow Englishman. Elsewhere, Drew Gulak presents Maverick with a bouquet of flowers and hopes he will provide changes for "a better 205 Live." Maverick just passes the flowers off to the stage hand he was talking to. Mustafa Ali takes a seat in a room, talks about the match he had last week on 205 Live with Cedric Alexander and mentions the "This is awesome" chant that occured. He says that with this tournament he needed the wake-up call, wants to steal the show every time, and plans to win the championship at WrestleMania. Dasha interviews TJP backstage and brings up his string of losses since he's been back. TJP brags about being the first-ever Cruiserweight Champion at the Cruiserweight Classic, but then Drake Maverick shows up to talk to him. Drake mentions he heard about the CWC, says that was a long time ago now, tells him that Tyler Bate is hungry for a win, and gives him a harsh pep talk wanting to know which TJP will be out there tonight - the TJP who won the CWC, or the TJP who whines and complains. Akira Tozawa is walking in the halls disappointed about not becoming the new 205 Live GM, but says he will advance in the title tournament, pretends to fire someone, and walks off smiling. It's the first Cruiserweight Champion taking on the first United Kingdom Champion! TJP won the new Cruiserweight Championship and became the first champion in a tournament during the summer of 2016. Tyler Bate won the new United Kingdom Championship and became the first champion in a tournament last year in the UK. Like I mentioned above, WWE sure loves their tournaments to crown new champions. The bell dings, TJP backs him to the ropes, and they have a clean break. TJP with a rear waistlock, Bate takes an arm, TJP counters and brings him down to a knee, Bate reverses it, TJP counters out into the handstand headscissors, 2-count, dabs, 1-count, Bate counters with his own headscissors, TJP kips up but Bate holds onto his wrist and puts him back in the hold. TJP gets to his feet, breaks free but Bate quickly re-applies it as the crowd does dueling chants. TJP escapes, Bate kips up, TJP whips him, Bate bounces off the ropes, TJP floats onto the apron, Bate goes after him, TJP slides under him, rolls him up for 2 then puts him in a surfboard stretch. Bate rolls over to reverse the hold, dead-lifts him in the stretch and swings him back and forth. Bate rolls him up for 2, hits a shoulder block, flips over him, dropkicks him, TJP rolls out the ring, Bate fixes his mustache before hitting a suicide dive and kips up outside the ring, then checks his mustache again. Bate throws him back into the ring, gets on the apron, shoulder to the gut, tries for a sunset flip, TJP holds onto the ropes to block, then attacks the left leg. TJP goes on offense now with a European uppercut, a boot to the throat, delivers a suplex, spins around, belly-to-back suplex, 2-count, then applies a pretzel-legged butterfly lock as we get a shot of the abeyant Cruiserweight Championship at ringside. Bate counters, shoulders to the gut in a corner, charges at him, TJP catches him and locks in a half-crab in the corner, releases at the ref's count of 4, body slams him and hits a slingshot senton for 2. TJP works on the leg, Bate kicks him off, hits a kneelift, headbutt to the gut, European uppercut, running kick to the face, running European uppercut in a corner, diving knee to the back of the head and delivers a delayed German suplex bridging for 2. TJP blocks the Tyler Driver, kicks him in the knee, picks him up for the Detonation Kick, Bate escapes, TJP charges in a corner, Bate catches him, delivers a T-bone suplex, kips up, limps around, hits a beautiful running shooting star press and gets a near-fall. Bate hits a European uppercut, TJP hits a forearm, they trade shots, they both kick each other, Bate fires back with a boot, TJP dropkicks him in the knee, and both men are down. TJP grabs his leg, Bate kicks him off, TJP with rapid strikes, Bate bounces off the ropes, TJP trips him and locks in the KNEEBAR! Bate struggles and reaches the ropes to break the hold. Bate blocks the Detonation Kick, TJP shoves him, Bate bounces off the ropes, hits a lariat and gets a near-fall. Bate calls for and delivers the AIRPLANE SPIN, limps around at the end of the rotation, slams him down, sets up the Tyler Driver, but TJP counters and goes for the kneebar, but Tyler counters with a rollup for 2.9! Bate catches him looking with BOP and connects with BANG. Bate goes to the top rope, goes for a corkscrew senton, TJP rolls out of the way, Bate crashes to the mat, and TJP locks in the CLUTCH KNEEBAR! Bate struggles through the pain, chooses not to tap, rolls around towards the ropes and grabs it for the rope break. Bate hits a back elbow, spinning European uppercut, and a rolling kick to the back of the head. Bate goes for the Tyler Driver, TJP grabs the ropes, counters with a rollup, grabs the trunks and gets the 1-2-3! WINNER and Advancing in the Championship Tournament: TJP. TJP is back in his winning ways, Bate can't believe he got duped, and TJP dabs to add insult to injury. Next week, Kalisto takes on Lince Dorado, while Hideo Itami will face NXT's Roderick Strong! TJP does one more dab to end the night. That's all for 205 Live!